Why read at home when you can read amongst 30,000+ volumes of poetry. Why go to Poets house? Poets House boasts 50,000 volumes of poetry in an open, eco-friendly environment that affords a view of the Hudson River and the Statue of Liberty. 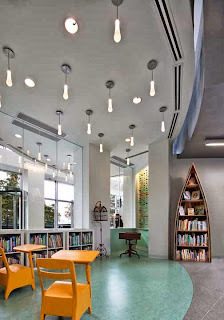 Founded by the American poet Stanley Kunitz, the space is ideal for reading, studying, and writing. Expect books. No public computer terminals. The computer terminals are for catalog access only. You can either read your own book or a poetry book available from the shelf. There are even typewriters available for the budding writer to practice her craft. There is a room specially reserved for quiet in the back. It has couches! I go on Saturdays sometimes. The last time I went they served free wine and beer! Best for poets and writers or people who want to be inspired creatively. A very inviting space. The staff are especially courteous.